I. Constitutive Aspects of Morality (Philosophical Issues Defining the Moral Domain). The Meaning of Moral Ought. (J. Habermas). Between Aristotle and Kant–Sketch of a Morality of Recognition. (A. Honneth). Contexts of Recognition–Comments on Axel Honneth's Moral Perspective Beyond Aristotle and Kant. (M. Brumlik). Emotions and the Origins of Morality. (M.C. Nussbaum). What Should Count as Moral Behavior? The Nature of "Early Morality" in Children's Development. (A. Blasi). II. Issues of Application. Discourse in Context. (V. Árnason). 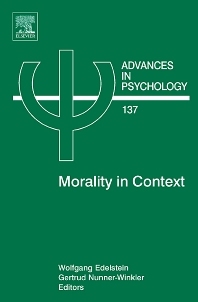 Moral Intimacy and Moral Judgment–Tailoring General Theories to Personal Contexts. (B. Puka). Moral Resilience–The Unhappy Moralist. (F.K. Oser, R. Reichenbach). Do Concepts Matter? The Impact of a Justice Framing on Responses to a Moral Dilemma–A Research Note. (R. Döbert, N. Juranek). III. Morality in Sociocultural Context. The Discontents and Contents in Cultural Practices–It Depends on Where You Sit. (E. Turiel). Changes in Moral Understanding–An Intergenerational Comparison. (G. Nunner-Winkler). Is Community Compatible with Autonomy? Cultural Ideals Versus Empirical Realities. (J.G. Miller). Is Community Compatible with Autonomy? Some Comments to Joan Miller's Research on Differing Moralities in India and the United States. (L. Krappmann). Reasoning About Moral Obligations and Interpersonal Responsibilities in Different Cultural Contexts. (M. Keller et al). IV. Morality, Autonomy, Identity. Partiality and Identity–Psychological Research on Preferential Behavior Toward Group Members. (M. Nisan). Culture, Context, and the Psychological Sources of Human Rights Concepts. (L. Nucci). To Forgive and Forget. (A. Margalit). Researchers and students in cognitive and social psychology.